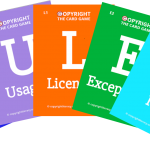 Copyright the Card Game – an open educational resource I created in collaboration with Jane Secker and Naomi Korn. I am currently running training sessions on this for Information Services and UELT staff at Kent. 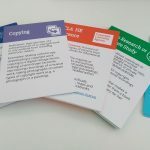 Education Licensing Working Group – a group I’m a member of that is “working with the Copyright Hub to support clarity, reduced bureaucracy and transparency in copyright licensing for schools, colleges and universities”. 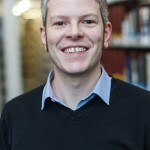 Copyrightuser.org – an excellent copyright information resource for creators and the general public. The Intellectual Property Office (IPO) – the official UK government body responsible for intellectual property (IP) rights including patents, designs, trade marks and copyright.